Archaeologists working on an ancient historical site in County Fermanagh have been given an extra week to finish their excavation. The Drumclay crannog lies in the path of a new road in Enniskillen that Roads Service said must be completed before the G8 summit in June. The dig is supposed to finish at the end of March. Environment Minister Alex Attwood said it had been extended three times since August. "It is clear that there was a bad start to all of this," he said. 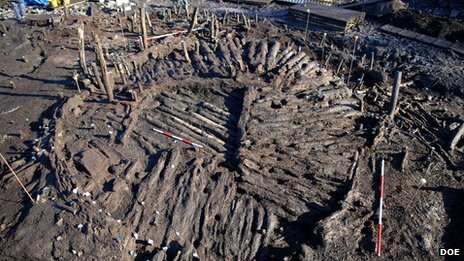 "First the crannog was disturbed and then the initial phase of excavation was wanting. "That is why I ordered a review of how this situation arose and what can be done to ensure it doesn't happen again. "The review is being conducted by experts, will involve others in the archaeological world and probe into all the issues. The review has been working for the last two months and an update is to come to me by Easter." The crannog - a man made island settlement - is situated on a site where the new A32 Cherrymount link road in Enniskillen will be built. The site has turned out to be more significant than anyone originally thought and over the last eight months more than 4,000 artefacts have been discovered dating between the 7th to the 16th centuries. They include the remains of 30 wooden houses, including one which is 12m in diameter. It may be the largest house structure of the period ever to be discovered and archaeologists have said their discoveries will re-write the history books of ancient Irish life. The archaeologists have now reached the bottom of the artificial island, which will reveal more about the very first settlers of the site. There has been a huge amount of public interest in visiting the crannog with hundreds of people on waiting lists for a place on a public tour. More than 1,000 people have signed an online petition calling for archaeologists to be given more time - saying this is a once in a lifetime opportunity to record over 1,000 years of history. The petition says: "The lost opportunity of archaeologically recording and studying the complete site is like loping off a wing of La Louvre in Paris, bulldozing a portion of the British Museum, or removing the inner chamber of Newgrange." 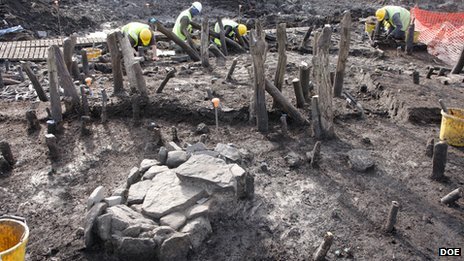 At first, archaeologists were given just six weeks to study the site before it was to be buried beneath the tarmac. Last July, a Roads Service official said they were not aware of the existence of the crannog before construction work began and they would have attempted to build around, rather than through the site, had they known. But archaeologists argue the existence of the crannog has been long known and is marked on a map dated 1835 and more recently it is recorded on the Environment Agency's own list of scheduled historic monuments. It was only when one of the archaeologists working on the site leaked photographs that revealed the crannog's importance and these were then published on a blog that concerns were raised. Environment minister Alex Attwood ordered a no-go zone for construction traffic but archaeologists believe much of the crannog by that time had already been destroyed - some suggest between a third and a half - and the whistleblower was fired. An independent review is to be carried out into what happened. Mr Attwood said: "The purpose of the review I have commissioned is to learn lessons from what happened in Drumclay and what went wrong in terms of the interference with the crannog. "The crannog would have been long gone if I had not intervened in early August 2012, put an exclusion zone around the crannog, approved funding for excavation measured in many hundreds of thousands of pounds and worked with the department for regional development to ensure a considerable period of time to progress the excavation. "All of this has been worth it, given the scale of learning and artefacts which the crannog reveals," the minister added. "As I have said, I will try to help further and hope that I can, but I also hope there is no attempt to diminish the huge efforts of government, ministers, archaeologists, and others since early August and the benefits that have resulted." A spokesperson for the Department for Regional Development (DRD) said: "DRD continues to work with Northern Ireland Environment Agency to resolve the archaeological excavation. "Whilst the minister has agreed to allow the crannog excavation to continue for a further week over the Easter holidays, we do not wish to see any further extensions as it is essential that this road is open in advance of the G8 summit in June." Fermanagh & South Tyrone Sinn Féin MLA, Phil Flanagan, welcomed the extension. "The significance of this find cannot be understated and the learnings that can be made from its excavation and the potential benefits in terms of the development of our local tourism sector are enormous," he said. "This site is of much greater strategic importance than the link road that is going to be built over it, a road that is of minor significance in Fermanagh. "The construction of the road can wait, but once this crannog is tarred over, it cannot be recovered. "G8 or no G8, an appropriate extension must be given to those working on this site to allow them to complete this important work." The excavation has revealed artefacts that show a snapshot of life in Ireland at least as far back as the 9th century AD. 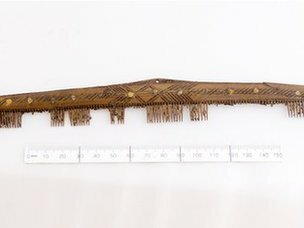 Among the finds are a wooden bowl that has a cross carved into its base, parts of wooden vessels with interlace decoration, exquisite combs, a large pottery collection, chess-like pieces for games, and timber foundations for dozens of houses.